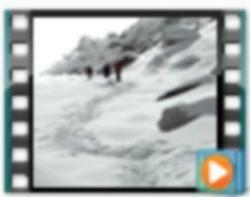 Summary: Pictures in this gallery are from a 20-day trek in the Everest region in September and October 2008. 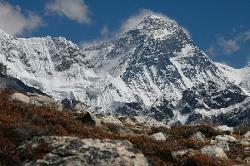 For the travelogue and itinerary, see my Everest travelogue. 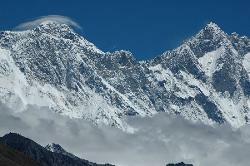 Map of Nepal and Khumbu. 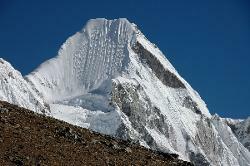 Map of Khumbu region with the route; starting in Lukla and then going counterclockwise from Chukung to Kala Patar; then Gokyo and finally return via the Thame valley. 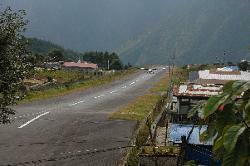 A short and spectacular flight from Kathmandu along the Himalayan chain culminates in the landing on Lukla's steep runway. 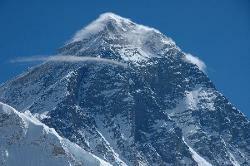 On the second day the high mountains already appear above us. 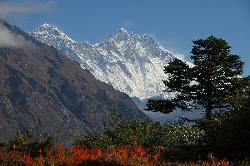 Namche Bazaar; the hub of Khumbu; and starting point into the three picturesque valleys to the north. 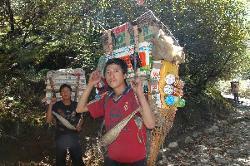 Trails are busy; not with many tourists because the main season will start in three weeks; but with local porters carrying loads up to fill up reserves in the lodges. 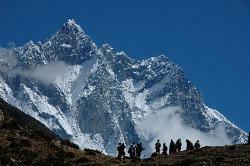 There's few things that are not available; trekking in Khumbu is not the ultimate adventure but a pleasant and semi-luxurious walk in stunning scenery. 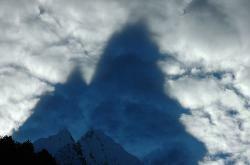 Clouds in the lower parts increase the appearance of the high peaks; the sun creates huge shadows in the morning clouds. 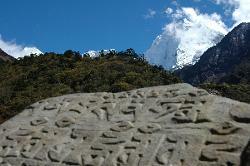 Kangtega rising over mani stone; forest reach up to almost 4'000 meters. 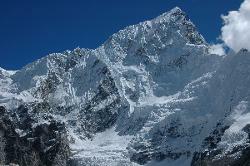 The deeply crevassed south-west face of Kangtega. 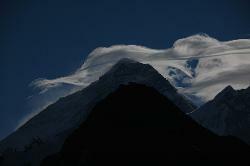 Mount Everest with its characteristic clouds near the summit and Lhotse on the way to Pangpoche. 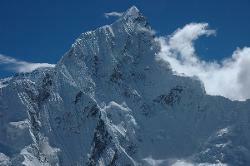 The massive wall of Nuptse and Lhotse rises above us. 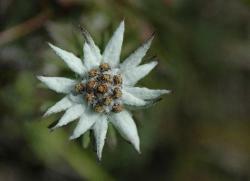 At the end of september some flowers are still out; like edelweiss. 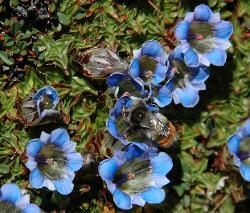 Nepal gentians; a little more round than the species from the Swiss alps. 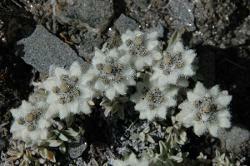 Higher up the edelweiss protects itself against the cold nights. 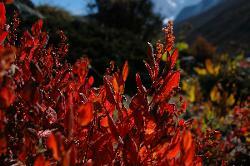 Intense colors at high altitude. 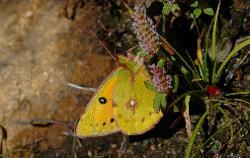 Nepal features a huge number of butterflies; some even at 4'000 meters above sea level. 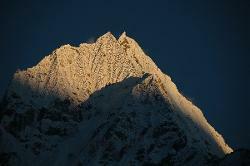 Sunrise on Lhotse's main peak; 8'516 meters high. 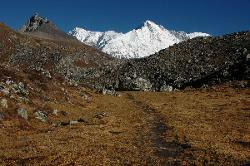 Passing alpine meadows on the way to Dingboche. 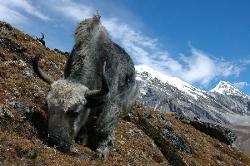 Yaks are grazing on the colorful hills with 8'000 meter peaks rising in the background. 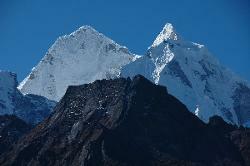 Kangtega summits rising above the black faces of lesser peaks. 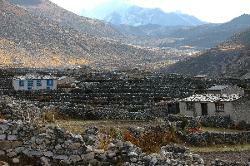 Farmhouses in the wide valley of Dingboche. 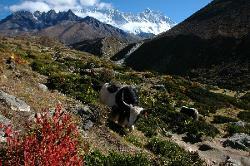 Growing potatoes and herding yak is still important despite tourism. 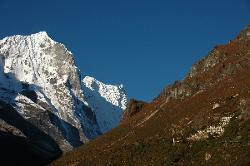 Above Dingboche lies the hermitage of Nangkartshang; a steep climb up reveals fantastic views up the Island Peak valley with Makalu rising in the very right. 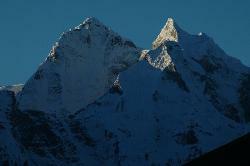 Stunning flanks of peaks surrounding Ama Damblam. 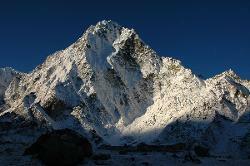 Early sun on Ama Dablam and its north-eastern face. 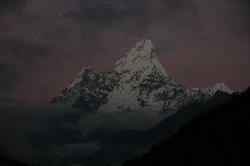 Play of light on Ama Dablam. 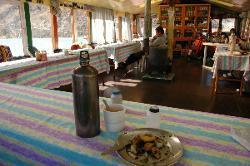 Breakfast in the cozy lodge in Chukung; not many tourists seem to come up here in late September. 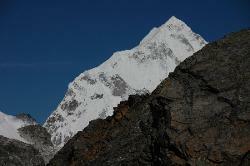 Back on the main trail towards Gorak Shep the number of tourists increases; but the scenery is truly stunning and no wonder it attracts so many people - here a fine view of Lhotse flank and summit. 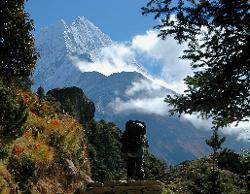 Leaving Ama Dablam behind; we walk north up towards Kala Pattar. 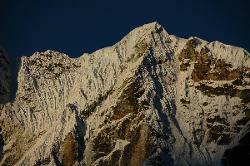 Staying in Dhugla is a good way to escape the crowds; and to enjoy a fine sunrise on Taboche and Cholatse. 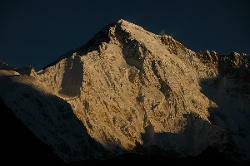 Cholatse in full sunlight while the valley still lies in the freezing darkness. 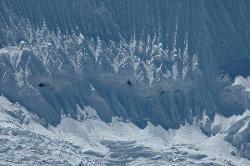 Nuptse is dwarved in size by surrounding summits; but the ice-clad west face is a very impressive sight. 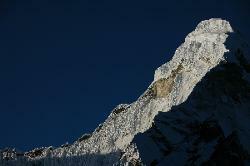 On the way to Kala Patar with Pumori rising high above into the dark blue sky. 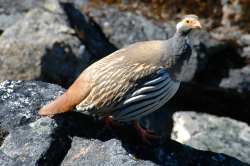 Video on top of Kala Patar. 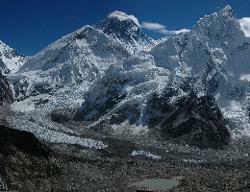 View from Kala Patar; 5'545 m; on the Everest glacier (base camp at the very left); the beginning of the icefall leading to the south col; Everst's summit hidden in ligh fog; Lhotse to the right of the south col and Nuptse at the very right. 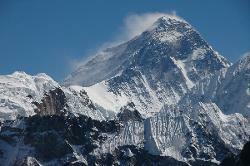 Mount Everest; a massive black pyramid; fog lies like a veil on its summit. 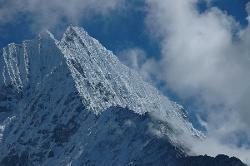 Then the fog lifts; and reveals the south shoulder and the entire upper part. 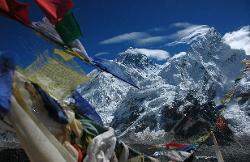 Another view of Everest; Lhotse and Nuptse rising above the prayerflags. 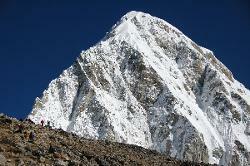 Lingtren is a summit of stunning geometrical proportions. 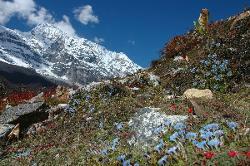 Kangtega seen from Lobuche; after a night of light snowfall the sun quickly melts the first layer and the flowers come out again. 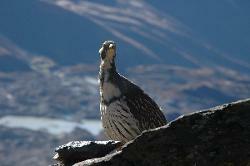 The two basic lodges of Dzongla fill up quickly: the location at the foot of Cholatse is stunning. 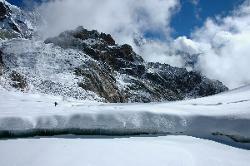 On the way to the Cho La; looking back east from where we came; once you reach this part it's a stroll through the snow. 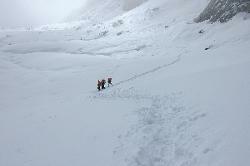 Video of crossing the Cho La pass. 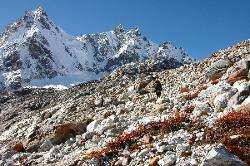 Almost at the pass; Tenba on the big snowfield. 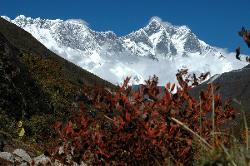 Stunning last part of the Cho La pass. 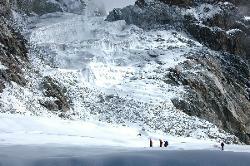 Porters crossing the big glacier in the opposite direction; Cholatese in the background. 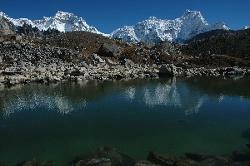 Early morning in Gokyo; Cho Oyo reflection on the lake. 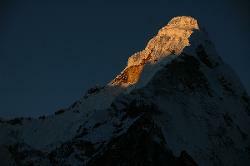 South face of Cho Oyo catches the morning sun. 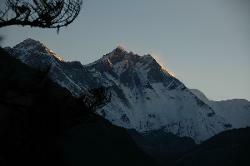 Cho Oyo - view from the guest house. Cho Oyo last moments in magic light. 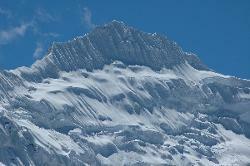 While climbing up to Gokyo Ri the black pyramid of Mount Everest creates bizarre clouds in the jetstream. 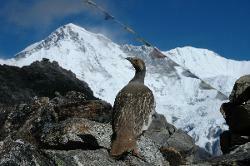 Tibetan snowcock on top of Gokyo Ri; the birds don't seem to mind the altitude of 5'457 m.
Tibetan snowcock peeking around the corner. 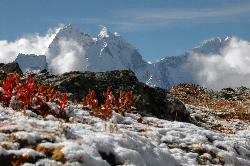 Cho Oyo in the background; with Tibetan snowcock posing for a good shot. 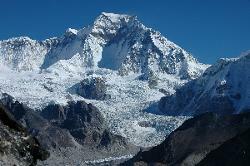 Gyachung Kang rising above an ocean of ice; with 7'952m one of the many peaks that are almost 8'000 m high but never get mentioned because they lack a few meters. 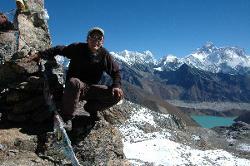 From Gokyo Ri the views of Everest and Lhotse are stunning; revealing more than Kala Patar even though not being as close as from Kala Patar. 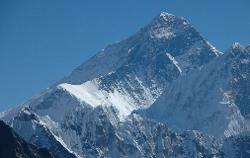 Close-up of Mount Everest and its north face from Gokyo Ri; the main route from the Tibetan side follows up the left shoulder. 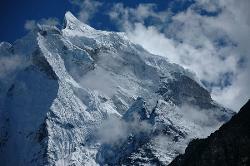 Pasang Lama Chuli; 7'352 meters high; forms the western buttress of Cho Oyo. 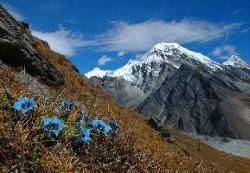 Gentian with Lobuche peak in the background. 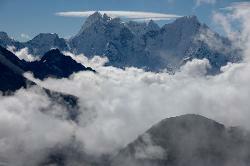 Clouds often move in at noon; time to return to the lodge and enjoy a lazy afternoon. 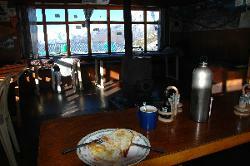 Back the lodge with a great views and great food; the wind is howling in the afternoon and after a tough morning walk there is nothing more cozy than to enjoy a great meal and taking a nap afterwards. What luxury, the simple, cozy and quite warm rooms! 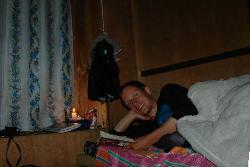 In late October they might be full; but in early October I had to stay in a dormitory only once. 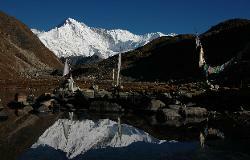 Instead of rushing through; you can spend a few days in Gokyo and walk towards Cho Oyo along its majestic glacier. 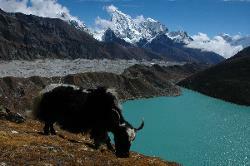 Yak grazing above Gokyo with peaks in the background. 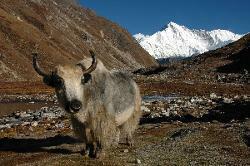 Another yak; just above the lodge. 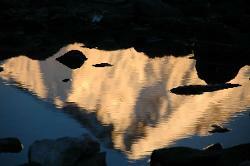 Some smaller lakes in the area offer reflections of stunning peaks. 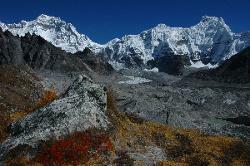 Gyachung Kang and Hungchi from the crest of the moraine. 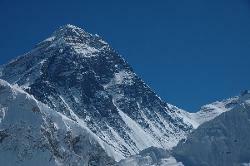 Mount Everest; probably my most favourite view during the entire trek. 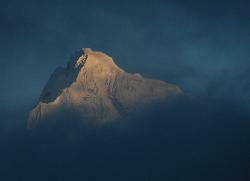 The very top of Cholatse rises above the mist in the evening. 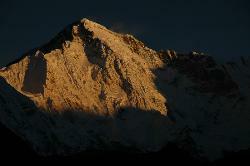 Sunset on Cho Oyo rising over the evening fog that is blown up the Gokyo valley. 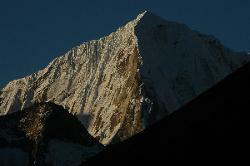 Last view of Cho Oyo before leaving for the Renjo La pass. 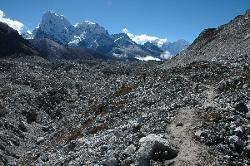 On the way to the last pass Renjo La that will take us into another valley. 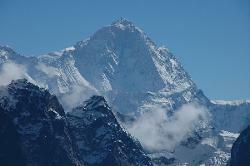 Mount Everest from Renjo La. 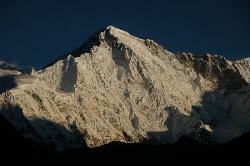 Makalu - the black mountain - from Renjo La. Perfect day to cross the pass and take a nice memorable shot. 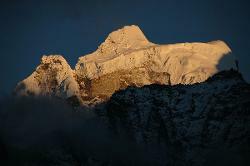 Sunrise on Thyangmoche peak from Lungden, a small settlement with a few lodges. 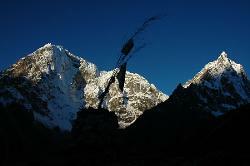 From Lungden; the peaks in the north catch the morning sun. 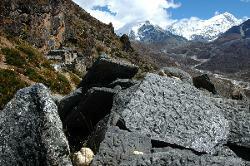 This is the way to the Nangpa La pass into Tibet. Summer settlements of farmers in the upper Thame valley. 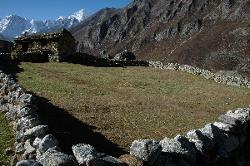 One of the farmhouses and summit of Thyangmoche in the background. 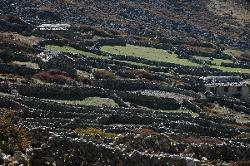 Langmuche peak rising above fields of gentians; the sidevalley does not see many tourists and is a good sidetrip from the main route back to Namche Bazaar. 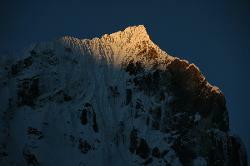 Sunrise on the steep flanks from Thame. The sun quickly rises and soon the entire face catches the rays. 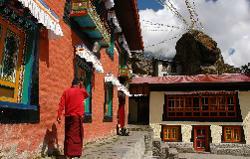 Thame's monastery overlooks the village; and offers fine views of the summits of Thyangmoche and others that lead to the Tashi Laptse pass into Rolwaling. 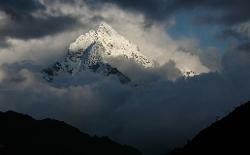 Thamserku in clouds in the late afternoon. 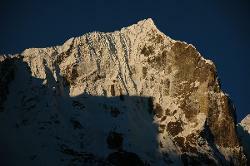 The sun will rise over Kangtega and Thamserku any moment. 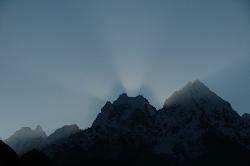 The early rays slowly climb up over the ridge. 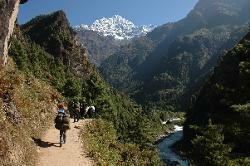 The trail to Shyangmoche goes gently up the valle. Out of the forest the views open up to reveal Tamserku. 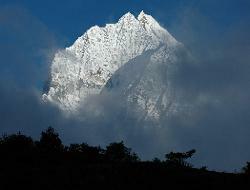 Fog is blowing up from Lukla; and increases the grandeur of the mountain flanks. 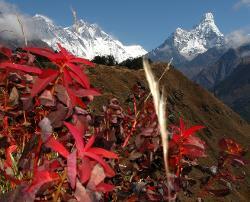 Kumjung lies an hour above Namche; and views from there are so fine that it is worth staying a night in the village. 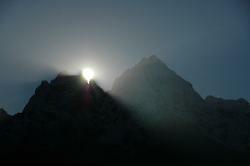 From Kumjung; the evening atmosphere is announced by cold fog engulfing the peaks. 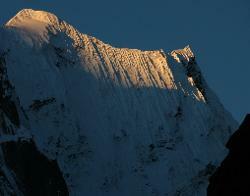 Last rays of the sun hit the flanks of Thamserku. 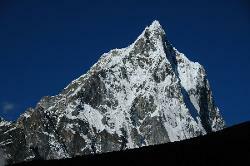 The upper part of Kangtega in the evening sky. 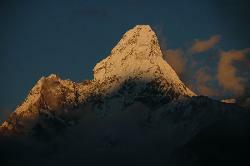 Ama Dablam; a peak stunning from all sides; offers the best sunset views from Kumjung. 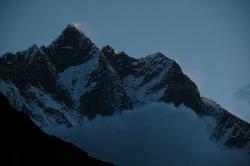 Nightfall on Ama Damblam; time to get back to the warm lodge and enjoy hot dinner. 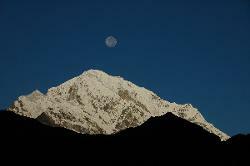 Moon over the summits in the west near Rolwaling. 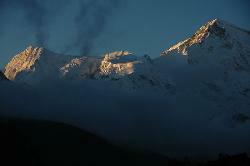 Sunrise on Mount Everest and Lhotse from Kumjung; though it is bitter cold it is always worth getting up early. 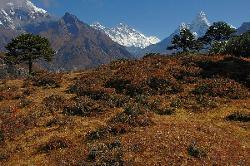 When the sun hits it gets warm; bushes and trees get their color while Mount Everst and Ama Dablam turn from silhouettes into real mountains. 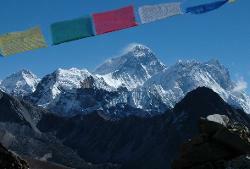 Mount Everest and Lhotse; high summits above the colorful pastures. 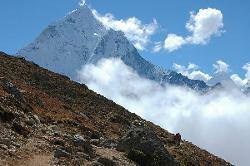 Last view of the giants of the Khumbu before entering the low valleys towards Lukla. 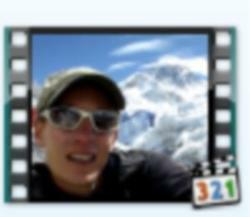 Video flying from Lukla back to Kathmandu.